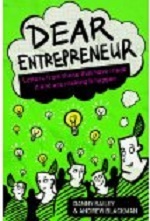 The following may give you an idea for a last minute Christmas present for the budding entrepreneur you know ….. The first book I ever read was back in 1999………. Like him or loathe him, you’ve got to admit it, Richard Branson has a list of achievements unmatched by any other UK businessman. He is a dynamo of drive and guts with enough ambition to sink a battleship – or perhaps that should be a jumbo jet ! 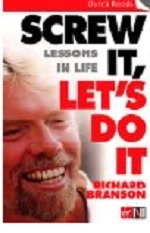 I found Branson’s autobiography immensely fascinating reading. Richard bares his soul, from childhood, school days (cheating at exams), loves and losses (lost one wife when a spot of wife-swapping went drastically wrong–for him), death-defying adventures (yes, the balloons are all there), to the rise and rise of the Virgin empire. 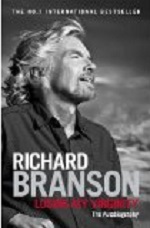 It is still great – Branson talks in a very down to earth manner – this is a very good quick summary, which, if you like it, you should definitely then read his autobiography for more details on how he got where he is today. 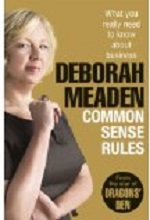 I love Deborah Meaden on Dragons Den – I cringe at times, but I love her straight talking, no nonsense manner. Her book is not an autobiography, although there are biographical elements. What it is though, is common sense business advice with real insight into what it takes to become a successful entrepreneur. Much about starting and running your own business is basic common sense. Most people over complicate things – especially in the beginning. Trying to do too much too soon is one of the top ten causes of business failure. I am constantly using the phrase in training “ its not rocket science” – and, you know what? ….. it really isn’t! 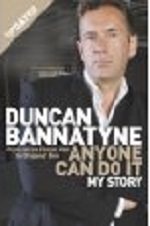 If, like me, you are an avid viewer of `The Dragons Den’, you will have already had a glimpse of the personality of Duncan Bannatyne. From the inability to hide a mischievous grin when faced with a weird and wonderful contestant or idea (and in some cases both! ), to getting seriously involved in negotiations on an idea he thinks could work, you will get a hint as to why he is successful. He enjoys what he does and he seems to enjoy life. We are constantly analysing what success means to us as individuals and how we are to achieve it, and this book provides a fun way of defining both personal and professional success. 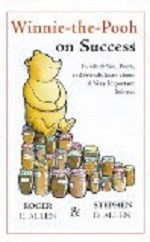 Through imaginary conversations with Pooh, Owl, Piglet and the other inhabitants of the Hundred Acre Wood, the content lays down how to plan and set manageable objectives. Getting right back to basics with, setting goals, planning, and organisation – and it’s all centred around achieving their goal – Eeyore’s birthday party. It’s a fabulously relaxed style and has great illustrations – the perfect bedtime read for anyone interested in analysing what they want from life and how that can be achieved . A collection of ‘letters from those that have made it and are making it happen’. Danny and Andrew set about writing to people to ask how they had gone about setting up in business – and decided to publish the replies. Read this book and who is to say you won’t start the biggest adventure of your life?